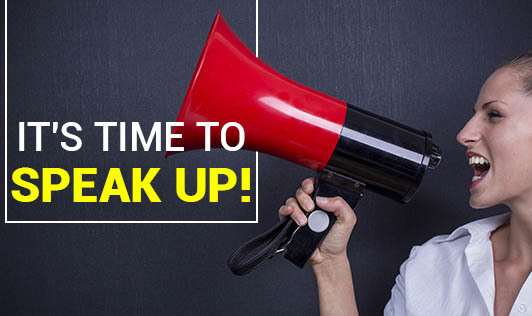 It's time to speak up! We often try too hard to please others around us, making great sacrifices to avoid pain ad rejection. As a result, we may end up feeling uncomfortable with ourselves. There are times when we are doing our best but we may still feel it's not good enough. In this race to please and satisfy others, we can lose our self-esteem and confidence in our uniqueness (Speak your mind, be yourself by Andre Carvajal). Loved ones do have some degree of expectations about us, but these expectations are a complement of our life but they can also become infinite, making it difficult to set up limits. If you are not going to be open about your feelings and speak your mind, you are not going to happy. Pleasing those around you and not yourself is self destructive. You will have to overcome disillusion, rejection and learn how to say "No". We tend to find new worries in every corner of life; the best way to handle such situations is to make an effort to be yourself, speak your mind and to live by your own values and priorities. Furthermore, one should focus all his/her energy in finding stability by accepting that sometimes he/she makes assumptions. Having a strong conviction in oneself, not depending on compliments or reinforcements and being receptive to demands and expectations without losing oneself is the key! Remember to be happy with yourself and don't let others fight your word battles; you will have to do it yourself!